Third, there are more subtle impacts from using a higher GDP number, even if a fraudulent one. This is illustrated in the following chart. 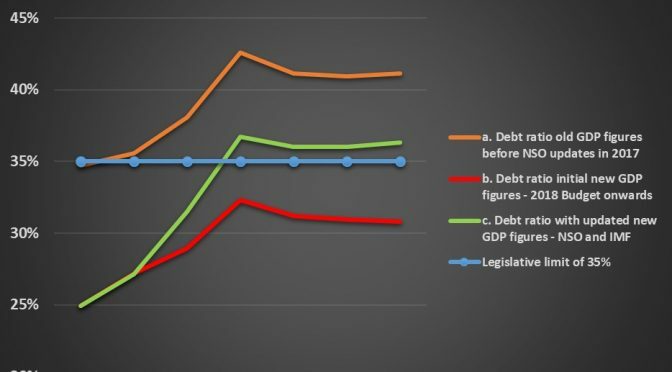 The chart uses official GDP debt levels contained in the 2019 and earlier budgets for all three lines – so the only variation is disagreement about GDP levels. The top orange line shows the situation using the original PNG Treasury numbers – so before the 2017 NSO update. 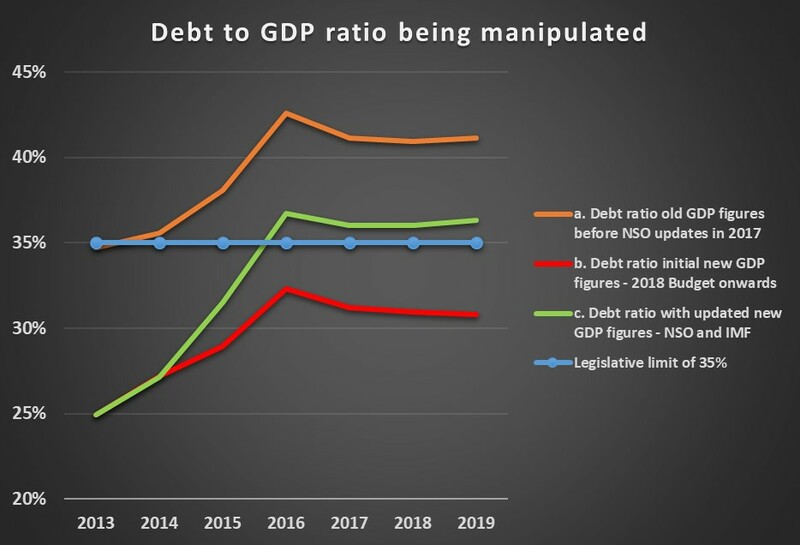 Projected debt levels were going to keep the debt to GDP ratio above the limit set in the law of 35% (under the Fiscal Responsibility Act). This would have been politically embarrassing. Holding the debt to GDP down would have required a lower budget deficit, requiring less spending or more taxes. Since the 2017 election, there has been little appetite for constraining expenditure – there have been very large increases in expenditure in Treasurer Abel’s first and second budgets. Hopefully other donors can follow the lead of the IMF and other independent commentators in not simply accepting the economic narrative from the PNG government which is increasingly being based on manipulated economic and budgetary statistics. PNG’s institutions will struggle to turn the economy around when it is so far off course and its economic compass of genuine statistics has been so seriously corrupted.